1. to provide information, recreation, and fellowship for area car enthusiasts. 2. to provide activities for club members. 3. to provide activities for non-member car enthusiasts that cause them to visit Washington. 4. to provide positive experiences and general help for all in the Washington community. 1. collect dues and run 50/50 cash drawings at all meetings and activities to raise money for general club business. In the past, we have purchased items such as: tables, a trailer, signs, etc. We also advertise our events. 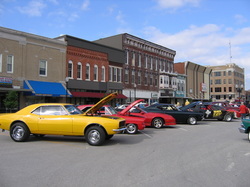 a) provide entertainment at our cruise-ins for both the car people and the general public in attendance. b) provide door prizes for (non-member) car owners to get them to travel to and experience Washington. c) provide prizes to Children for our kids' games. At the end of each year, after determining an appropriate carryover/seed money balance, the club has made donations of any excess funds to local non-profit/charity organizations or scholarships to area high school seniors.